Tyvan Irrigation – Tyvan Irrigation installs & maintains underground sprinkler systems for residential & commercial clients in Calgary & the surrounding area. From raising the bar with our lifetime warranty & all-inclusive maintenance package, to the most intelligent irrigation control platforms available on the market. We ensure you are provided with the best products available. Our underground sprinkler systems utilize high efficiency products such as hunters high efficiency MP Rotator nozzles, Rainbird pressure regulating spray bodies. This allows our zones to span larger areas, saving you money & ensuring system zoning is based off water requirements and not flow. Along with smart irrigation controllers, our systems provide you savings year after year. Irrigation systems may not excite most people, but here at Tyvan Irrigation we enjoy the design of every system we install & maintain. Proper planning is vital to any project’s success regardless of the size and complexity, irrigation especially. This is why we ensure all our irrigation systems are professionally designed to ensure head to head coverage from the start. Following the latest methods, bylaws & regulations our systems operate with the environment and Calgary’s unique climate in mind. 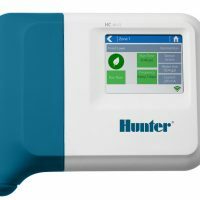 Fully automated, The Hunter HC dynamically creates a intelligent watering schedules based on over 8 environmental factors. Imagine an irrigation company that calls YOU for your annual maintenance, ensuring you never forget to winterize your sprinkler or test your double check valve. One that goes the extra mile to ensure all your needs are met, questions are answered year after year. That is who we are, We understand you want a underground sprinkler system to reduce your workload, that is why we go above and beyond to provide an all-inclusive product & service from the start. From our life-time warranty to our all-inclusive maintenance program, we have developed a process that allows us to provide exceptional customer service year after year. We believe in our product & workmanship, that is why we offer a life time warranty on all our systems. As required by City of Calgary Code, we install DCVA ( Double Check Valve ) with a full 1 Inch Pex Mainline for maximum Flow. We use hunters latest high efficiency nozzles, providing more coverage per zone. Saving you Money & Water. We handle all maintenance required for the system. All repairs due to faulty materials or workmanship are covered free of charge. To maximum the efficiency of the system we utilize pressure regulating heads with check valves. Unlike other companies, we install swing joints on all our heads to further protect them from damage. Sit back and relax as the professionals at Tyvan Irrigation install your next generation sprinkler system.